Using the right words for the job is as important as choosing the freshest shrimp for your world-famous paella. We spend a lot of time helping our clients to cut out jargon. We ask them why they’re using five words when one will do. We wonder if that middle paragraph might be easier to understand if it was a list. I’ve spent the last eight months in Germany and noticed that they solve the plain speaking problem differently. Germans seem to prefer using one word to express an idea even if, technically, it’s six smaller ones mashed together (Donaudampfschifffahrtsgesellschaftskapitän, anyone?). Sometimes, though, ideas that take a dozen words to explain in English can be expressed auf Deutsch in four syllables or less. Who knew? Here are seven I find particularly charming. Weltschmerz – [world pain] the pain of knowing the reality of world will never measure up to the ideal in your head. A concept familiar to Sunderland supporters. Futterneid – [food envy] that moment when you realise the food your dining companion has ordered looks much tastier than yours and you’re filled with deep regret. Waldeinsamkeit – [forest lonely time] the pleasure (or terror) of being alone in a forest. Spesenritter – [expenses knight] someone who bigs themselves up by conspicuously paying for everyone else’s dinner on the company account. Kummerspeck – [grief fat] the newly wobbly bit that appears around your middle after a long spell of emotional overeating. Fremdschämen – [alien shame] feeling embarrassed on behalf of someone who doesn’t realise they have done something embarrassing. Dad dancing, mom jeans and the like. 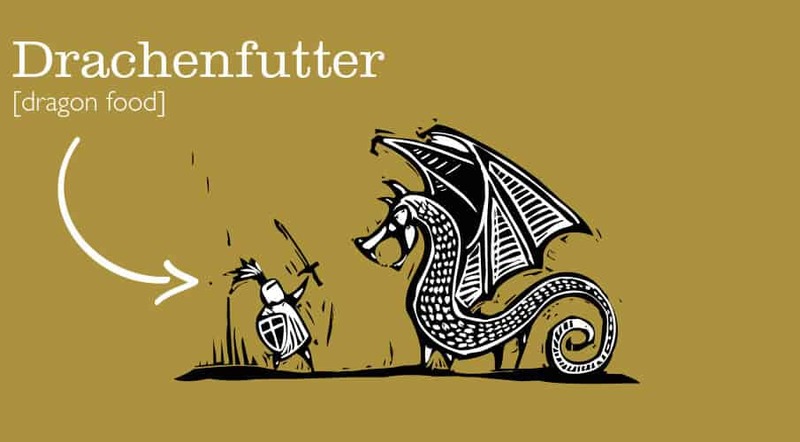 Drachenfutter – [dragon food] a present given to your wife after you’ve made her angry. Usually contains diamonds. But these moments of language genius aren’t just the preserve of the Germans. Let us know what some of your favourites are in English, German or otherwise. Marcia Adair is a freelance journalist living in Cologne, Germany. Her work has appeared in the Los Angeles Times, The Financial Times and The Globe & Mail. She also writes copy, ghostwrites books and hearts the cricket.